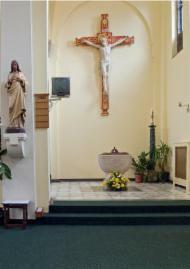 Baptism - Welcome to St Lawrences Church in Feltham, Middlesex. Our Baptism is the beginning of our life of faith, the beginning of getting to know and understand what being loved by God means. Baptism is God's token to us of his great love. Our faith carries us forward to the Sacraments, but when we are babies it is the faith of our parents which brings us to the Sacrament of Baptism. Often people don't bother so much about the practice of their faith when they leave home and get married. For such Christians, the birth of a baby and the questions of Baptism provide a focus for a new beginning. Parents presenting babies for baptism at St Lawrence’s are required to attend a Baptism preparation course. If you have a child for Baptism, please contact Fr John via the Parish Office. Or complete and return a Baptism Request form, available in the porch, and Fr John will contact you.